When checking out, choose "pick-up" to save on shipping costs! Items can be picked up in Haus West any time. Personalized duffel bag orders for basketball season must be made by November 2 for delivery before Thanksgiving. 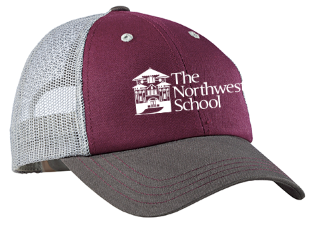 We have a whole host of items showcasing The Northwest School logo and colors. All proceeds from our spirit wear sales go towards the Raymond Taussig Terry Financial Aid Endowment. Furthering our mission of sustainability and social awareness, we have selected two clothing companies that have a clear commitment to fair practice and environmental consciousness: Bella + Canvas and Alternative Apparel. More than having strong commitments, these companies make top quality clothing. Not only will you feel good about how your clothes were made, you’ll just plain feel good in the soft ringspun cottons. Come by Haus West during office hours on Wednesdays, 2:45-3:30 or make an appointment with Leilani Nussman. Of course, you can also shop online 24/7. Select pick-up on the cart page to save money and resources on shipping.